Need some extra writing advice? Love highlighting and taking notes? These are some of the resources I recommend the most. Enjoy! This is one of THE most important things writers can teach themselves. Put this one at the top of your list if you are revising right now. Everyone knows (or should know!) this one. It’s the best guide out there, unsurprisingly, from one of the best in the biz. You’ve probably already taken some of this book in; there are quotes are everywhere on Twitter and Tumblr. This book is so good for learning how to take your work from ‘good’ to ‘great.’ Who doesn’t want that? Written from the perspective of a literary agent, too. Need help with descriptors? Finding it tiresome to think of ways to describe characters uniquely? This is the book for you. It’s your guide to writing character expression. If there is a ‘rulebook’ out there for fiction writing, I think this is it. Packed with the most information on general fiction writing that I’ve ever seen. Written by a literary agent, this book is a great guide for developing your plot. Want to better understand story structure? This one’s for you. Talk about style and voice. This book will change the way you think about writing. One of my all-time faves. Push this to the top of your list. I loved ‘On Writing.’ What great advice. ‘Writing the Breakout Novel’ + Workbook are on my shelf, right next to ‘Bird by Bird.’ I plan to review both before is start to query agents. Here’s a reblog from an agent. Don’t know why E.M. Forster’s Aspects of the Novel doesn’t make the list. I suppose one has to stop somewhere. I loved my copy of On Writing, but then I lent it to one of my writing students. Alas and alack, it’s never been back. Great list! I recently read On Writing and was surprised by how much I liked it. My current favorite is Still Writing by Dani Shapiro. 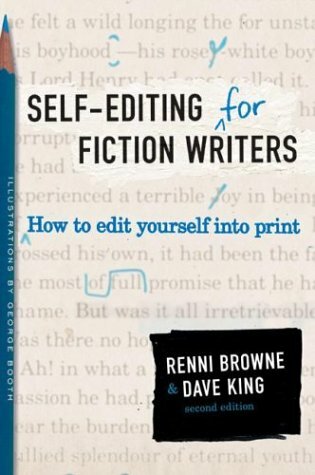 I am editing my novel now and feeling a bit lost, so thanks for recommending Self Editing! I’ll check it out for sure. Thanks for writing such a good book! What great company The Emotion Thesaurus is in! The only one of these I’m not familiar with is Passion for Narrative. I’ll have to check it out. Thanks for including us! I teamed with four other editors to expand in a huge way what Rennie and Brown did with their short book. If writers want to really get into the flaws of fiction writing and see 60+ before and after passages, The 12 Fatal Flaws of Fiction Writing is a more in-depth (and much more current) resource. Hope you all check into it. If you don’t have a few of these books on your shelf, dear writer, then I strongly suggest you do. I have three of the eight and plan to go out and get a couple more that Carly suggested. Let me know how you find the book suggestions.